Tracking Accuracy Test is a psychomotor (eye-hand coordination) and planning-ahead exercise. Test takers have to channel an aircraft through a steady stream of blue and orange circles moving downward from top of screen. 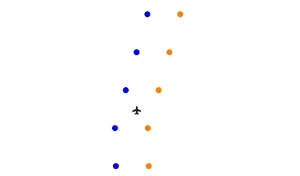 The aircraft may not hit the circles and can only be moved laterally from side to side to avoid collisions.